This church originally stood at the corner of 10th and Market Streets and was the first Presbyterian church in the city. It was constructed in 1740, just after Wilmington received its charter from King George II. 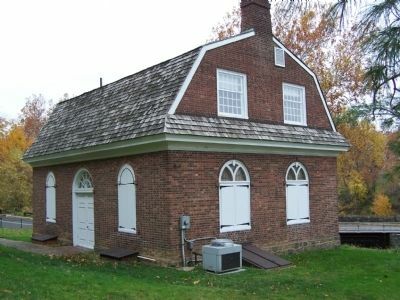 Following the Battle of the Brandywine on September 2, 1777, the British used the building as a hospital. 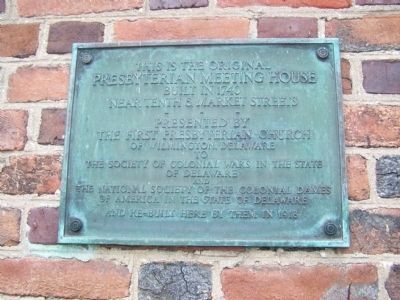 After the congregation moved to a larger church in 1878, the Delaware Historical Society used the building until 1916. 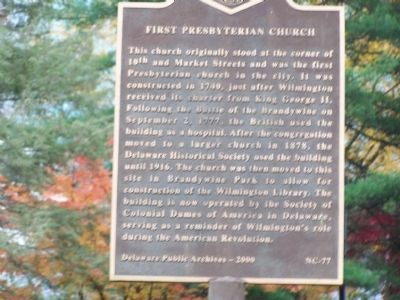 The church was then moved to this site in Brandywine Park to allow for construction of the Wilmington Library. 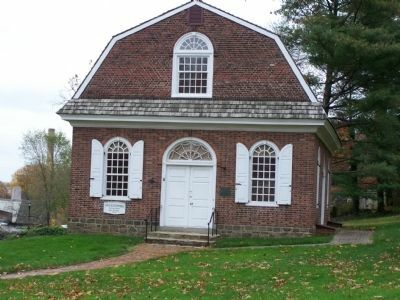 The building is now operated by the Society of Colonial Dames of America in Delaware, serving as a reminder of Wilmington's role during the American Revolution. Location. 39° 45.068′ N, 75° 32.867′ W. Marker is in Wilmington, Delaware, in New Castle County. Marker is at the intersection of South Park Drive and West Street on South Park Drive. Touch for map. Marker is in this post office area: Wilmington DE 19801, United States of America. Touch for directions.
. McKinley (within shouting distance of this marker); Looking Back... (was within shouting distance of this marker but has been reported permanently removed. ); a different marker also named Looking Back... (within shouting distance of this marker); H. Fletcher Brown: The Man and the Vocational School (about 700 feet away, measured in a direct line); Washington Street Bridge (approx. 0.2 miles away); a different marker also named Looking Back... (approx. 0.2 miles away); John McKinly (approx. 0.2 miles away); Old Soldiers' Park (approx. 0.2 miles away). Touch for a list and map of all markers in Wilmington. Credits. This page was last revised on June 16, 2016. This page originally submitted on November 14, 2008, by Bill Pfingsten of Bel Air, Maryland. This page has been viewed 1,579 times since then and 5 times this year. Photos: 1, 2, 3, 4. submitted on November 14, 2008, by Bill Pfingsten of Bel Air, Maryland.